"The Modern Cook's year is a recipe led account of what happens in my kitchen throughout the year, from the food that I lean on as the year passes to the things I feel like cooking. It's written in six chapters, each of which roughly knits together two months at a time – I find a year divided into four seasons a bit too vague. Just step into a greengrocer on the summer side of autumn and then again as autumn turns into winter and you’ll see the difference. There are so many more subtleties to what’s growing than spring, summer, autumn and winter, and my new book is an ode to them really. I’ve really tried to show how to make the most of seasonal produce, using simple, inventive flavours and ingredients. I’ve also included tips on everything from seasonal music playlists to flowers to look out for in each month of the year. My mornings start with Dylan, my two year old. We’ll play and I’ll have a cup of hot water and lemon, quickly followed by a cup or two of Lady Grey with milk or a cup of milky oat milk chai. Before Dylan, my first reaction on waking was to immediately want to fall back asleep. Mornings seem a lot brighter and more positive now he’s around. There’s no going back to sleep, so we end up sitting and playing in bed for the first hour of the day. We always have breakfast together. Usually my husband John will make us a bowl of fruit or overnight oats which we sit and eat together. Dylan will have his favourite breakfast of porridge and some kind of fruit. Usually there’s a cookbook or two on the table, or the weekend papers which with a little person around it takes us the whole week to read. Sourdough – more often than not, I’ll have a bowl of something with grains for breakfast, but sometimes only a slice of chewy sourdough cuts the mustard. My husband gets grumpy whenever we run out of E5 bakehouse’s Hackney wild loaf. Milk – usually a plant mlik oat, almond, coconut, occasionally good organic cow’s – open my fridge door and more often than not there will be a few different bottles. Honey - Drizzled over plain yoghurt, stirred into steaming cups of tea or spread onto toasted sourdough, I couldn’t live without honey. 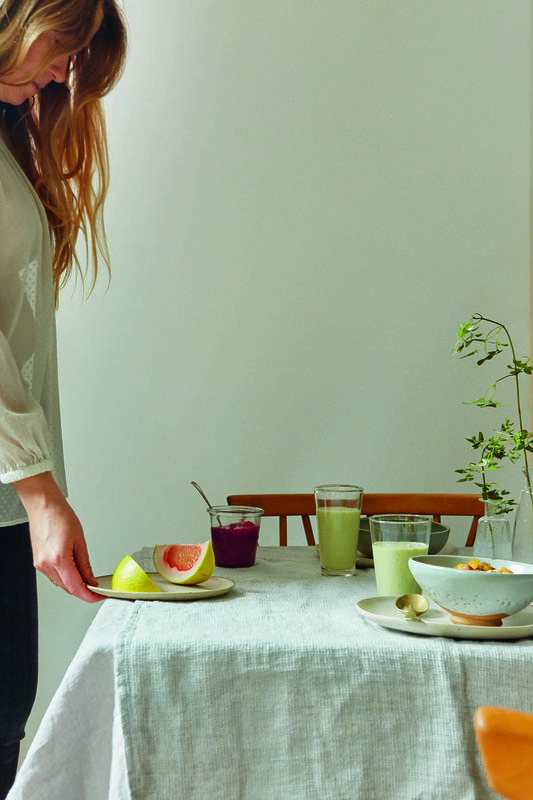 Fruit – you’ll find a bowl of whatever is in season on our breakfast table. At the moment our breakfast bowls are topped with gently spiced pears. Oats – so versatile and amazing carriers of flavour. Porridge or bircher muesli. All-time favourite breakfasts are always impossible to choose. 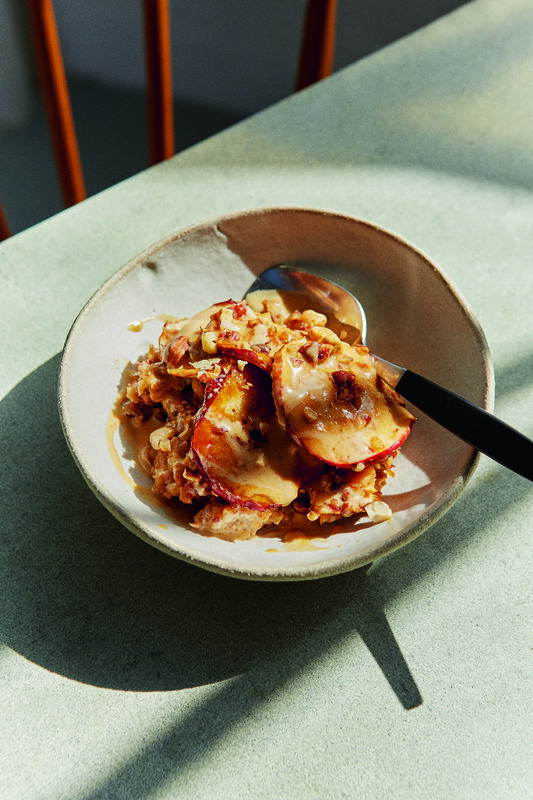 I can only tell you what I’m making at the moment – which is a baked apple porridge recipe so delicious it’s almost like dessert. The snap of cold that comes this time of year is perfect porridge weather. I’ve never understood those who eat it like clockwork, regardless of the temperature. I love the warmth of it on a cold day, a bowl in my hands like a morning hot-water bottle, the quick but nourishing time spent stirring at the stove a welcome interruption to the busy rush of the morning and a few minutes to let my mind wander at the start of the day. This porridge is a bit different in that it is baked so the edges crisp and the starry apple slices on top soften and burnish. I top it with a maple cream so good it’s hard not to spoon it all straight from the dish before the porridge is ready. It takes a little longer to make than a regular porridge – it’s a weekend one. One thing I need to do less of in the mornings is… Checking my emails before breakfast is never a good idea. One thing I need to do more of in the mornings is… Meditate. Whenever I make the time I feel better. How I feel when I wake up is always related to the quality of sleep I’ve had. Putting the screens away long before bed time. Making sure I early in the evening. Trying not to work late. I often don’t manage all or any of these things but I know when I do I sleep much better."